Backstage Academy provides the best possible training for the flourishing live events industry with fantastic industry links and access to production facilities for teaching and learning. Founded in July 2009, we have quickly earned a reputation as a centre of excellence for backstage training, specialising in degree courses, short courses and bespoke training programmes for young students, established professionals and community groups. We are based in Wakefield, West Yorkshire, in the largest purpose-built production rehearsal arena complex in Europe, LS-Live, which counts Jay Z, The Stone Roses, Dizzee Rascal, Lady Gaga, Robbie Williams, The BBC, ITV and Monster Energy amongst its clients. As a privately funded organisation, we bridge the gap between industry and education, working closely with leading professionals to respond quickly to current skills shortages and write training programmes in line with specific demands. We provide relevant, up-to-date training so that degree students get a real taste of what life is like in the backstage entertainment industry, with a focus on employability. Our graduates have gone on to gain employment with the Jay Z world tour, the Winter Olympics, the Mumford & Sons tour, the Glastonbury site office, Leeds Festival, LS-Live, Alton Towers, Well Pleased Events and Genesis Theatre. Backstage Academy has some of the best facilities in the country for backstage careers training. Based at Production Park in Wakefield, home of businesses including Litestructures, Brilliant Stages, Perry Scenic Creative, LS-Live arena rehearsal complex, and KB Events, students benefit from access to state-of-the-art studio space, staging rental department, set construction facilities and real-life learning spaces. One of the things that makes us so unique is our link with the LS-Live rehearsal arena at our headquarters, which we use for hands-on practical training sessions. 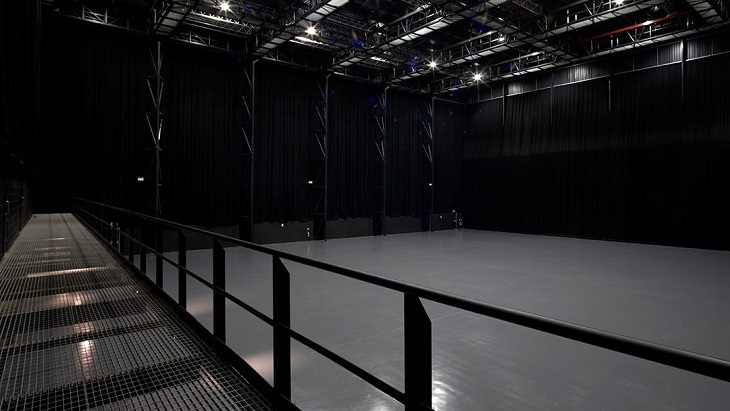 It’s a purpose-built and highly flexible space that’s normally used for touring show rehearsals, film shoots, product launches, test builds and events. The 32m long by the 42m wide studio has a 128-tonne roof capacity from its 18.2m high rigging beams, 1200A (3 phase) power, and four loading bays, meaning it can accommodate any large-scale production. The Studio may be used for rigging training, lighting practicals, stage builds and other practical sessions. Students may also be given the opportunity to do work experience on the productions that come to the Studio. There are five rehearsal studio’s on-site bringing a variety of world-class tours and productions to the park, including Muse, Take That, Florence and the Machine and Foo Fighters. Recently restored, Grade II listed live music venue, Unity Works in Wakefield opened in September 2014 and is the base for our BA Visual Production degree, as well as providing teaching environments for our other degree courses. Attached to the arena are Backstage Academy’s modern facilities, including an Apple MacBook Pro, based IT suite running a range of industry standard programs, a full d3 visualisation and edit suite including HD projection and surround sound, a 3D stereoscopic projection system and a range of classroom and seminar spaces to accommodate both academic and practical work. We have a number of flexible spaces that can be used for a range of different creative, hands-on workshops. Most are equipped with a 3-phase power supply, air-conditioning and blackout blinds. Specially designed to move with the trends of modern events, the Backstage Academy Live Visual Design and Production BA (Hons) course is widely regarded as a trailblazer within the live events industry. Live production is an increasingly prominent market, and our full-time, three-year course has been sculpted alongside high ticket industry firms such as d3 Technologies, FIX8Group, Green Hippo, PRG XL Video and Panasonic in order to nurture promising students into industry-ready professionals. The Stage Management BA (Hons) degree is the first of its kind dedicated to delivering the next generation of Stage Managers for Live Events, including theatre, touring, corporate, sporting, and live outdoor events and festivals. There is an exciting range of events that require specialist stage management skills to ensure their smooth running, and it is with this course we give a unique insight into managing everything from theatre stages to TV location work, and sporting events to festivals.